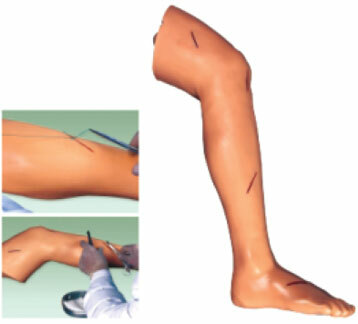 This model of Advanced Surgical Suturing Leg allows the students to practice cut, suturing, stitches release, enswathing, etc. The elasticity and flexibility of skin can make it for practice hundreds of times. There are some initial wounds on the leg and if all the initial wounds have been sutured, people can cut the leg in other place for new training of suturing.